Linden Police Officers Victor Pozsonyi, Matthew Matlosz, Slawomir Polchlopek, Daniel Viana, Jonathan Berrios, Michael Rozycki, Renald Dume, and Laron Capers were sworn in during a ceremony at City hall on December 14, 2018. A total of 19 Officers have joined the department’s ranks in the past two years. 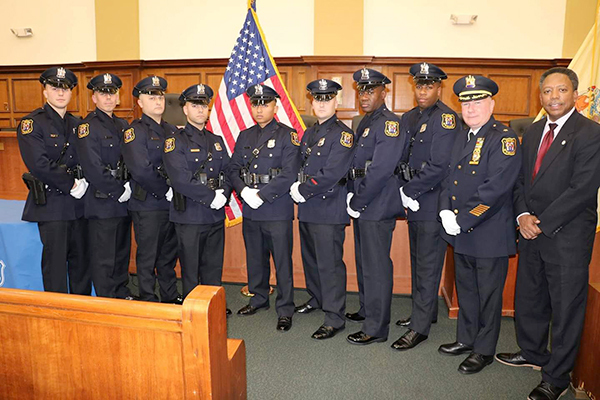 The Officers were hired in July of 2018 and immediately began their training at the John Stamler Police Academy in Scotch Plains. They graduated in the 119th class on December 19th. During the graduation ceremony Officers Matlosz & Pozsonyi were awarded the Physical Fitness Challenge Award, and Officer Berrios was awarded the Charles Jotz Marksmanship Award. (above) Linden Mayor Derek Armstead with newly sworn in Police Officers Victor Pozsonyi, Matthew Matlosz, Slawomir Polchlopek, Daniel Viana, Jonathan Berrios, Michael Rozycki, Renald Dume, and Laron Capers.